This sgian dubh has no blade WHICH makes it a safety sgian dubh. Dummy Safety Sgian Dubh. This Sgian Dubh has no blade. Safety sgian dubh. Highland Thistle design. This perfectly sets off your Highland outfit. THE DESIGN IS ORNATE YET EFFECTIVE, FEATURING A SGIAN DUBH DESIGN. Universally worn on all kilts or kilted skirts. Highland Celtic Kilt Pin. THIS IS A LOVELY SOLID PEWTER KILT PIN. 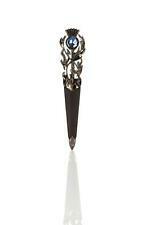 THIS STUNNING KILT PIN IS MADE OF HIGHLY POLISHED PEWTER. Budget Safety Dummy Sgain Dubh no blade - made of black plastic resin design pewter mounts. I’m one of scotlands leading sgian dubh makers . This type is normally made with either stainless steel blade or Damascus steel blade but these are not permitted to be sold on eBay uk so I’ve developed the same high quality product with a sgian brew blade ... If it’s a real sgian dubh you are looking for contact me and I’ll direct you to eBay.com ...i will answer any questions you may have Condition is New with defects. Dispatched with Royal Mail 1st Class. This Sgian Dubh, has been handcrafted in Scotland, by the country's Leading Sgian Dubh Specialists. This sgian dubh has no blade WHICH makeS it a safety sgian dubh. 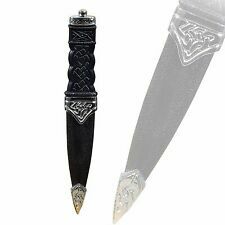 This Sgian Dubh has no blade and is made of plastic resin, it has three Polished Pewter Mounts in thistle and celtic rope designs. The sgian dubh is worn as part of traditional Scottish Highland dress along with the kilt. It is worn as part of traditional Scottish dress tucked into the top of the kilt hose with only the upper portion of the hilt visible. This sgian dubh has no blade WHICH makes it a safety sgian dubh. Dummy Safety Sgian Dubh. This Sgian Dubh has no blade. Safety sgian dubh. with Faux Cairngorm Stone. The handle is topped with a Faux Cairngorm coloured stone. This Sgian Dubh, has been handcrafted in Scotland, by the country's Leading Sgian Dubh Specialists. This sgian dubh has no blade WHICH makeS it a safety sgian dubh. Dummy Safety Sgian Dubh with Faux Red Stone. This sgian dubh has no blade WHICH makes it a safety sgian dubh. Dummy Safety Sgian Dubh. This Sgian Dubh, is a good Budget item. This Sgian Dubh has no blade, it has three Antiqued finish Nickle Mounts, the handle has a simple thistle motif. I’m one of scotlands leading sgian dubh makers . This type is normally made with either stainless steel blade or Damascus steel blade but these are not permitted to be sold on eBay uk so I’ve developed the same high quality product with a sgian brew blade ... If it’s a real sgian dubh you are looking for Contact me and I can direct you to eBay.com ...i will answer any questions you may have Condition is New with defects. Dispatched with Royal Mail 1st Class. This sgian dubh has no blade WHICH makes it a safety sgian dubh. Dummy Safety Sgian Dubh. This Sgian Dubh has no blade. Safety sgian dubh. Highland Serpent design., it has Antique Finish Mounts and an Antique finish Handle, which has a stunning two headed Highland Celtic Serpent Design. This sgian dubh has no blade WHICH makes it a safety sgian dubh. Dummy Safety Sgian Dubh. This Sgian Dubh has no blade. Safety sgian dubh. Highland Thistle Design. This Sgian Dubh, has been handcrafted in Scotland, by the country's Leading Sgian Dubh Specialists. This sgian dubh has no blade WHICH makeS it a safety sgian dubh. This Sgian Dubh has no blade. Safety sgian dubh. This sgian dubh has no blade WHICH makes it a safety sgian dubh. Dummy Safety Sgian Dubh. This Sgian Dubh has no blade. Safety sgian dubh. Highland Serpent Design. Sgian Dubh. A sgian brew ia a unique alternative to the safety sgian dubh, featuring a bottle opener in place of the blade. Kilt Jackets. Kilt Sporrans. Kilt Belts and Buckles. Kilt Hose Socks. Kilt Flashes. Sgian Dubh. Kilt Jackets. Kilt Sporrans. Looking just as stylish as a normal, bladed, sgian dubh it's embossed thistle design gives it a classic look. Kilt Belts and Buckles. Kilt Hose Socks. Kilt Flashes. 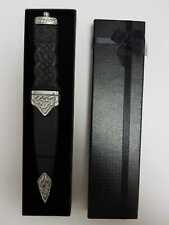 A Fantastic Economical Imitation Safety Sgian Dubh. This traditional styled safety sgain dubh has no blade so is safe for all ages. You will not have problems with sub standard products at Kilts Wi Hae as we do not have any. Custom made sguan brew hand carved lignum vitiae handle silver mounts and a green agate stone see photos for details. This sgian dubh has no blade WHICH makes it a safety sgian dubh. Dummy Safety Sgian Dubh. This Sgian Dubh has no blade. Safety sgian dubh. Highland Serpent design. This perfectly sets off your Highland outfit. 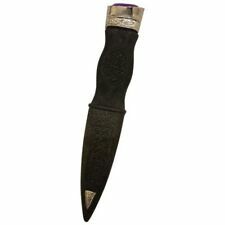 This Sgian Dubh, has been handcrafted in Scotland, by the country's Leading Sgian Dubh Specialists. This sgian dubh has no blade WHICH makeS it a safety sgian dubh. Dummy Safety Sgian Dubh with Faux Blue Stone. TC Kilt Safety Sgian Dubh, monture factice en étain antique avec pierre orange. Ce dubh sgian est livré avec différentes pierres sur le dessus. Type KILT SGIAN DUBH. Monture factice antique en étain avec pierre orange, TC Kilt Safety. This sgian dubh has no blade WHICH makes it a safety sgian dubh. Dummy Safety Sgian Dubh. This Sgian Dubh has no blade, it has three Polished Nickle Mounts, the handle has a simple thistle motif. This Sgian Dubh, is a good Budget item. This Sgian Dubh, has been handcrafted in Scotland, by the country's Leading Sgian Dubh Specialists. Dummy Safety Sgian Dubh with Faux Cairngorm Stone. This sgian dubh has no blade WHICH makeS it a safety sgian dubh. This Sgian Dubh, has been handcrafted in Scotland, by the country's Leading Sgian Dubh Specialists. This sgian dubh has no blade WHICH makeS it a safety sgian dubh. Dummy Safety Sgian Dubh with Faux Jet Black Stone. This Sgian Dubh, has been handcrafted in Scotland, by the country's Leading Sgian Dubh Specialists. This sgian dubh has no blade WHICH makeS it a safety sgian dubh. Dummy Safety Sgian Dubh. This Sgian Dubh has no blade. NEW KILT HIGHLAND WEAR SAFETY SGIAN DUBH DUMMY. Budget Safety Dummy Sgain Dubh no blade - made of black plastic resin with thistle design pewter mounts. Can be worn anywhere, it can even board an aircraft! 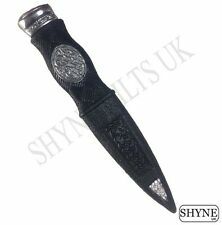 Budget Safety Dummy Sgain Dubh no blade - made of black plastic resin with thistle Badge design pewter mounts. Budget Safety Dummy Sgain Dubh no blade - made of black plastic resin with pewter mounts. Can be worn anywhere, it can even board an aircraft! as it purely is just plastic without a blade and therefore Safe.